this one is absolutely lovely--any chance that there will be prints of it in your etsy shop? 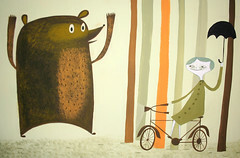 bears and bicycles are both very special to me. Such a delicious thought... why, it makes me think I ought to take up riding in the hope that I might one fine day encounter such a bear. Your work is a visual treat. another bear, and this time huggable! i need to get out more and spot one of these charming creatures!